The most luxurious of hardwoods, a Walnut boardroom table stands apart from other woods. Each piece of Walnut used to make our boardroom tables display unique characteristics that makes each piece one of a kind. The surface of our boardroom tables reflect the life of the tree it comes from, we make smooth features out of natural knots, cracks, grain variations and colour differences, you will never find a boardroom table the same as yours. Our Walnut boardroom tables are solid and durable. They are built to deal with the daily life of busy, growing companies. Companies that want a stunning piece of reliable furniture to have those key meetings around. We make our tables easy to maintain and clean so you can focus on growing your business, our Walnut boardroom tables require minimal upkeep and are wiped clean in moments. Why not make those important decisions around a piece of furniture that is long lasting, beautiful and durable. Choose a unique Walnut table with a frame that reflects your company. At Mac&Wood, every table is hand made and bespoke to suit your company. We want you to focus on directing your company, expanding your business and keeping it growing day after day. With a centrepiece of such absolute quality at the heart of your company you’ll never feel adrift or insecure. 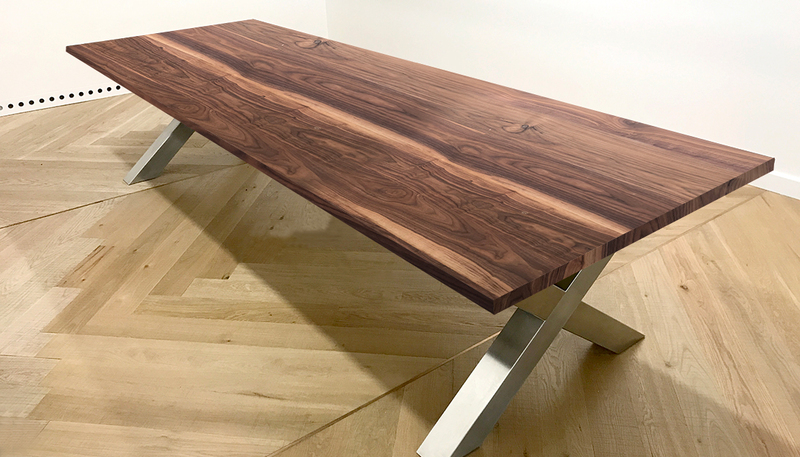 Here at Mac&Wood, we know that your Walnut boardroom table will become the centrepiece of the work environment, expressing the philosophy of your business without words, and we are dedicated to capturing your style and vision, transforming it into reality.